"It is amazing how rumors in this sport spread. One thing that I noticed is that there is no shortage of them in F1 and they all seem large. Not one is about something as trivial as the health of a driver." This comes at a very appropriate time as rumors multiply in the off season, only to be denied and debunked with a rapidity that amazes. Today, the day after Dietrich Mateschitz was reported to have confirmed that Red Bull were talking to Alonso about a seat for 2008, Helmut Marko has announced that the report was utter nonsense and they are not interested in a deal any shorter than three years. In the past few days, the Alonso to Ferrari rumor has been dealt a severe blow by Marc Gene pointing out that the existing drivers have very firm contracts for the next two years at least, and HWA have denied that they have any plans to enter F1 in any way whatsoever. Rumors have short lives these days. Most of them begin with a reporter finding himself short of anything to write about and becoming creative, therefore. It's a simple enough task: just take two or more reports, put them together and work out some connections that lead to a sensational conclusion. We could do it now with a couple of items from recent F1 news, just as a demonstration. Let's take the journalist's gift of the past decade - Michael Schumacher. Anything written about the multiple champion will sell and he has done us the favor of popping up again recently in the Barcelona test. It helps that he was fastest and that he is now set to test for Ferrari again in Jerez. Is the old man coming back? Well now, if he were to come back, how could he do it? Ferrari seem pretty decided on their drivers for the foreseeable future so it can't be there. But Ross Brawn is now employed by Honda - maybe Michael is thinking of rejoining his old comrade in arms. And then there's McLaren - they have an empty seat at the moment, I hear. But no, I think Ron Dennis has had enough of multiple champions for the moment; let's go for the Honda option. A while ago there were all those doubts about Barrichello continuing, so that should help. It is surely impossible that Michael fancies a job as a test driver for Ferrari so his motivation must be much more obscure and unexpected. It has to be Honda - he's showing his future employers that he still has the speed! I have it - "a trusted source close to the great man himself"! I once had an unscheduled stop in Luxembourg, after all, and was only a few miles from the border with Germany therefore. And Michael is German. I must have been close to him then! And I trust myself implicitly. See how easy it is? We could even have competitions to see who comes up with the most sensational story backed with flawless logic. Who needs these official spokespersons anyway? We all know they say only what they've been told to say and that the truth lies deep and disguised within unguarded comments from others. Great piece of reporting, your onto a winner here Clive. I know that this is about as likely as Kimi's championship chances with two races left, (that happened...) But wouldn't that just be amazing? The Shu lifts Honda from near death, Rubins towing the line, and then Button going to McLaren and showing what he is really made of. Anything can happen in F1, Dan. And the scenario suggested is as likely as any other until things become settled! Love the competition angle, but why are we assuming a Schumacher return to F1 has to be behind the wheel of a car? Why not behind the wheel of the whole circus wagon? "Schumacher Rescues Sport From Captors : Michael triumphs again, Rejeuvenated FIA exiles Mosely to St Helena, Bernie last seen wandering the streets of Wimbledon, tail between legs"
Sorry, if I weren't so tired maybe I could have thought of a funny one. Hah, I though that was pretty funny, Verasaki, especially the bit about Max in St Helena. And it's a good point about Michael not necessarily coming back as a driver. There was plenty of speculation surrounded the possibility of him moving into team management or even ownership at the time he retired but that seems to have been forgotten, now that he's been in a car again. It could still happen, however. I couldn't let an opportunity like this go without trying. So here goes. Bernie has been very vocal recently about how the Renault spy scandal is less illegal than the McLaren spy scandal on the grounds that Renault got all its data in one lump rather than over a period of time. To me you are going to get the same sentence of you take all the gold out of Fort Knox one bar at a time as if you turn up one day and take the lot but that is not the point I suppose. So why is Bernie trying to make the distinction between the two. Is he trying to make Ron look bad so that he will be driven out and as rumoured HWA can come in and take over rather than start up a Mercedes B team? Surely Mercedes buying McLaren is a more attractive proposition than starting from scratch. Or is Bernard doing is usual thing of saying one thing and meaning another. Carlos Ghosn has often said that Renault are only in F1 while it is good for them. So a $100million fine is probably going to result in the sale of the team. Bernie no doubt would be happy to take the team off their hands for a 'fair' price. And of course he will know that those nice Malaysian people are looking at F1 and would be only too happy to sell them a team that was winning championships a year ago. Imagine again how much more appealing it would be to the Malaysians to buy Renault presumably with Alonso on board than to start building something from the ground up with Fairuz Fauzy. They could make him their second driver. He is so slow that Alonso may commit to a long term contract as he will have number 1 status in all but name and the team will want his team mate to do 90% of the promotional work. And Bernie in addition to a fat profit and the ongoing gratitude of both Renault and Malaysia gets the top three drivers in three different teams and all the controversy that could bring. So is Bernie trying to lead Renault down the garden path into believing they will not be punished severely when he knows they will get hammered and Ghosn will pull the plug? All for the good of the sport of course. If only he could get Schumacher into a Honda as well. Brilliant, Steven! An excellent construction using existing facts and faultless logic - it explains everything and leads us by the nose to your inescapable conclusion. Are you sure you've not missed your vocation and should be writing copy for Bild or one of those Italian sports magazines? I reckon you'd have them begging for more! I have heard over several sources on the internet that Coulthard have reconcedered his recent comments that he want's to stay at RedBull. It is even rumoured that he is willing to go back to McLaren to take the testdriver position when DeLaRosa gets promoted to the racng position. Coulthard, who repeatedly have said that McLaren is the best drive he ever had, would gladly get behind the weel at the team again, and this time without the hazzle of haveing to be criticised about driving slow in a bad car. And the input he could ad to the McLaren-team is must be invaluable, David beeing the most experienced driver out there. It have even been rumoured that the driver to fill in after Coulthard at RedBull would be Alonso, who after a stormy visit at McLaren is looking for a smaller and more relaxed team to drive for, and a team who is willing to sign him for just a season until he can enter his presumed seat at Ferrari in 2009. In other media there have been some rumours of cheating in Formula One. A scientist from Canada insinuating that the only way to be as successful as Hamilton would have been to use drugs or Steroids. Hamilton quickly replied that this was a lie ofcourse, but thinking of all the lying at McLaren this year, who knows. // This taken from the thin air, and my twisted mind, some or alot of it could probably sound quite truly to the general public, the ones who are not as initiated to the things going on in F1 as we are here at F1Insight. I can't believe I didn't jump to the logical conclusion of the Renault/Malasia deal. Bernie is looking for places in Asia to put on races in the middle of the night. So they not only get a team but a race. Bernie will make a few quid from Herman Tilke and no doubt will offer to operated the circuit to save them all the bother. Also Clive is a 6 headed purple alien. See he picked Honda to win the title, a car that was 'earth'. What better car for an alien trying to fit in on 'earth' to pick to make sure he looks human. He also picked the Englishmen over the Brazilian. He knew that most people who follow F1 are British, if he claimed he was British, no one would suspect a thing. This reminds me of something that happened at Midland Fans Online on April 2006. Basically, a bunch of us got so fed up with rumours that Christijan Albers/Tiago Monteiro/Colin Kolles/Toyota was going to be out of the team that we came up with our own rumours, some more plausible than others. Mine got slightly out of hand. I'll have to have a think about my entry for this competition. I'll post it here when I've got my creative juices flowing more. That's strange - it didn't post the links. Oh well, the thread is at http://www.f1network.net/boards/read/s495.htm?949,7731345 , and mine is near the bottom (it involves an unlikely Le Mans entry trio, the GP2 series and some computer-breaking accountant bloke. Looking forward to your entry to the competition - the forum one is excellent! Fun F1 has got exclusive photography of Fernando Alonso testing a red-and-white car. Judging by the livery, it is a mid-1980s McLaren, strongly indicating that he will be entering Historic F1 racing. Combined with the Fernando's statement at the start of last year that he plans on retiring from standard F1 before the age of 30, this suddenly looks very plausible. This also explains his presence at the Honda factory, because he wanted to check the quality of the engine in the the 1988 McLaren he is set to drive. 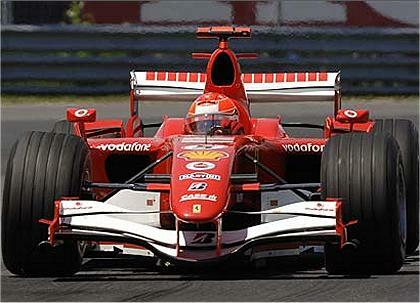 The same source also has secret pictures of the 2008 Ferrari. Obviously worried that it would have accidentally stolen concepts from the McLaren during the Stepney/Coughlan mess, it has gone for an extreme version of the "light, small and simple" design concept. We can safely assume from this that all the drivers for Ferrari next year will be short. There's also a handy lawnmower element on the bottom of the machine, suggesting that Ferrari will hire a complete rookie for the first time since Arturo Merzario at the British GP in 1972. Remember how Michael Schumacher was a permanent fixture in the Ferrari garage until Hungary this year, and has now been testing the Ferrari? Maybe, since the 2008 Ferrari is so small, this could be Mick Schumacher's entry into F1. Backed by Bernie Ecclestone (who has said that there is a need for more new blood in F1 and knows this may be his best chance to milk money from the Schumacher name). Kimi Raikkonen, despite his height, would be retained because Ferrari has to have the world champion after everything it's gone through to get it. Felipe Massa's three-year contract would be bought out by Fernando Alonso to make sure that he had a team-mate who would be his No. 2 when necessary, and also to strengthen his negotiating hand. Web search statistics indicate that a variation of the "sprinklers on random corners idea" is being considered. The commercialisation of F1 is very extensive, so it makes sense that its most profligate sponsor would supply a quantity of its product to be used to make F1 more exciting and riskier. Watch out for the branded blue Red Bull sprinklers - which will automatically become twice as heavy for Webber (because he's perpetually unlucky) and whoever the FIA hates this week. The same source tells me that the Malaysian Moneybags F1 team looks set to take over Prodrive's F1 entry. They have a $41m budget from their two intended drivers (Fairuz Fauzy and Roldan Rodruigez) and extra funding from the Malaysian government and all those Spanish sponsors who were disappointed when Fernando Alonso switched to historic racing (see first rumour). They are also going to pay all the Prodrive F1 people to stay on and work for them. The only problem was where to locate a replacement car in time for 2008. They eventually opted for the original-size 2008 Ferrari cars that Ferrari rejected when they embraced the "small-is-beautiful" concept, powered by a hastily-cobbled together Proton engine. The move will be legal because the customer car issue will be resolved with the solution, exclusively suggested by uppili, that a team must get its chassis and engines from different teams, and that customer cars will otherwise be permitted. Toro Rosso is unaffected by this rule, because it gets its chassis from Red Bull and its engine from Ferrari. Super Aguri, scared that Honda would give them the diabolical Honda 007 (aka License to Spill), decide to make their own in-house car. * - "Faking It" is/was a Channel 4 documentary where a member of the public got coaching for a month, and was then expected to pretend to be a member of a completely different profession well enough to convince a jury of three experts that the person was genuine. Notable for the rebellious young man who was supposed to pretend to be a racing driver, but was so arrogant that nobody was convinced. He didn't even have to get in the car before the judges saw through him. An excellent entry, Alianora. And an even more excellent blog - I've been working my way through your November entries, having fallen a little behind of late. Daily blogging is where it's at!